Our big train show is almost here already! It's that time of the year again - the club's biggest display is coming up, and as ever, you are all invited to come along and see what we've got for 2013! 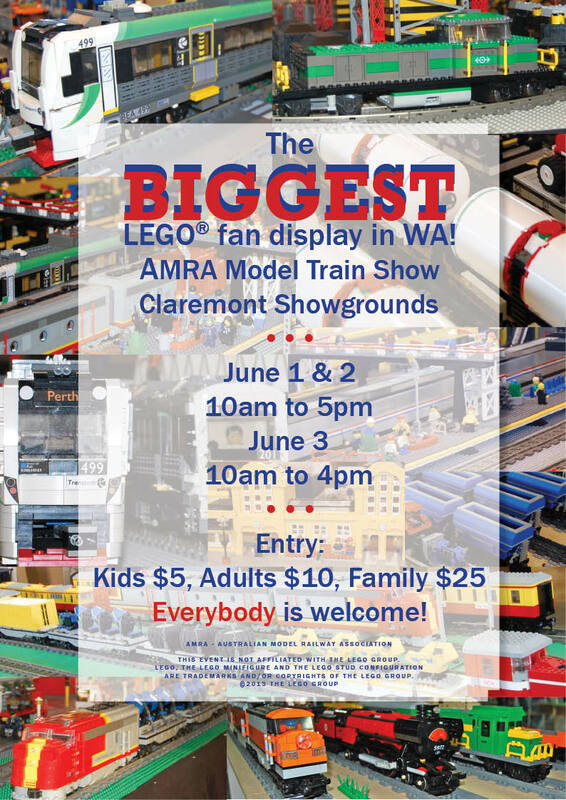 We will be on display during the Model Railway Exhibition at Claremont Showgrounds over Foundation Day long weekend! Trains on the Fremantle line will be stopping at Claremont Station on those days, but not Showgrounds Station unfortunately. For a printable version of the poster above, click here to view it. 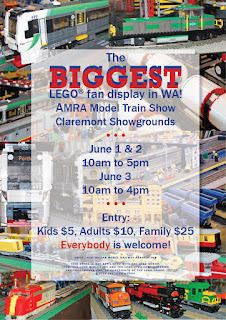 The Model Railway Exhibition is organised by the Australian Model Railway Association, WA Branch. This event is not affiliated with the LEGO Group. LEGO is a copyright and trademark of the LEGO Group. Do you have still plans of making this event once again? I wasn't able to join because I was busy on my essay writing during the said event.